It is my goal this year to eat healthier, remember I’m the woman that doesn’t like fruits and vegetables except for a select few. I came across this recipe for Cauliflower Rice and I thought “What the heck is that?! ?” Cauliflower doesn’t taste like rice at all. This isn’t exactly a substitute for white rice like how brown rice is. It’s a good alternative for rice especially if you love cauliflower and broccoli. I love broccoli so this recipe was perfect for me. I up my vegetable intake and try something interesting at the same time. 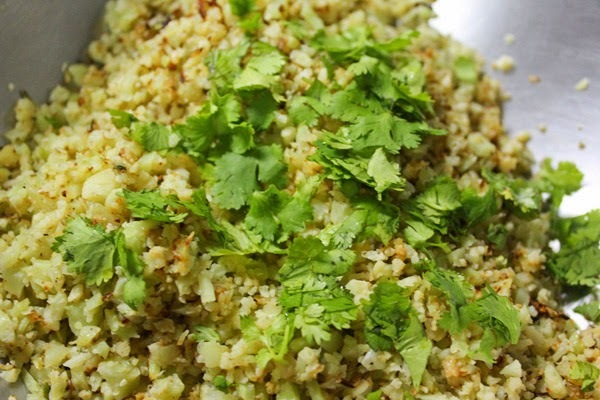 Grated cauliflower makes a fantastic low-carb, grain-free stand in for rice when you need a little carb detox. You can season this any way you wish – here I brightened it up with lime and cilantro and served it with a broiled pork loin. It has a couscous-like texture, and is perfect with chicken, pork chops, steak or anything you would normally serve with rice. Does it taste like cauliflower? Yes, it does so if you're not a cauliflower fan (I love it!) this may not be for you. But if you're a fan like me, you'll love this side dish! And it's also vegetarian, vegan and Paleo-friendly. Remove the core and let the cauliflower dry completely. 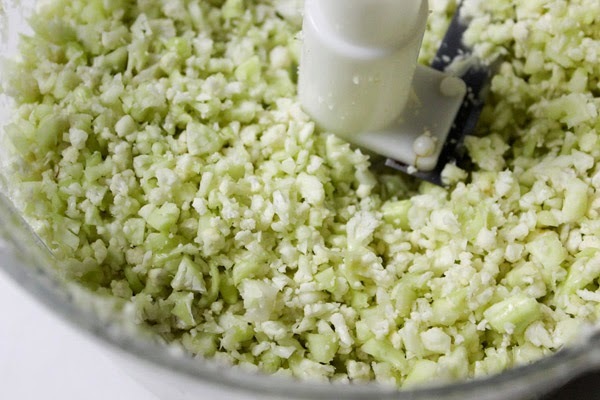 Coarsely chop into florets, then place half of the cauliflower in a food processor and pulse until the cauliflower is small and has the texture of rice or couscous – don't over process or it will get mushy. Set aside and repeat with the remaining cauliflower. Heat a large saute pan over medium heat, add olive oil, scallions and garlic and sauté about 3 to 4 minutes, or until soft. Raise the heat to medium-high. Add the cauliflower "rice" to the saute pan. Cover and cook approximately 5 to 6 minutes, stirring frequently, until the cauliflower is slightly crispy on the outside but tender on the inside. Season with salt and pepper to taste. Remove from heat and place in a medium bowl; toss with fresh cilantro and lime juice to taste. This recipe calls for lime and cilantro which gives the “rice” a citrus flavor. You’ll have to pick a good partner for the rice to compliment the citrus-ness. 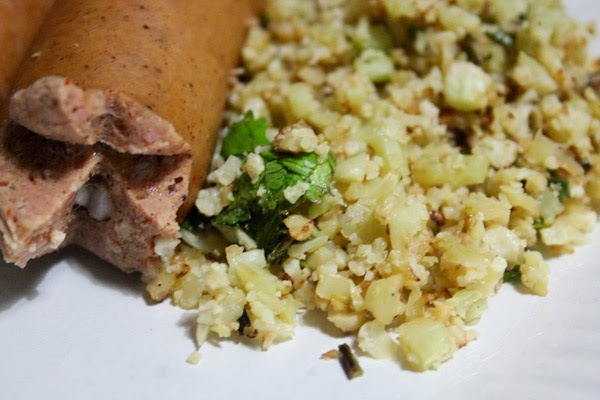 I paired our Cilantro Lime Cauliflower Rice with Hungarian sausage and it tasted great together. For my next version, I want to do a garlic version instead. This recipe is fairly easy and was a taste revelation. I took the most time cutting the cauliflower. Haha I now know 2 healthy dishes, yay! Remember, if I can do it SO CAN YOU!